Court hands down stiff sentence to two residents of Samaria arrested last year; lawyers say clients mistreated in custody. Two Israeli men convicted of "Price Tag" vandalism have been sentenced to two and a half years in prison each. A Magistrates Court sentenced Yehuda Landsberg and Yehuda Savir to 30 months, after they were found guilty of conspiracy to commit a crime motivated by racism or hostility towards the public, arson, and destruction of land motivated by racism or hostility towards the public, among other crimes. The two were also handed down additional 12-month suspended sentences, and ordered to pay damages to the tune of 15,000 NIS. 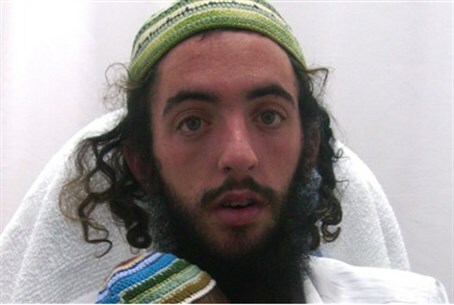 Landsberg, a resident of Gilad Farm in Samaria, was arrested last year in connection with an arson attack on the Arab village of Far'ata. He was indicted along with Savir and another man, Binyaman Richter, on charges relating to that incident. The indictments accused the three of leaving Gilad Farm in the dead of night on November 18, 2013, to commit random acts of vandalism and arson in a nearby Palestinian Arab village. The defendants succeeded and arrived at the Arab village of Madama, a 90 minute walk, the indictment claims. There, they allegedly tried to set fire to wooden boards and support beams in place for a new home being built and attempted to cause more damage with stones, but failed to cause any significant damage. Later, at roughly 3 a.m. on November 19, the defendants reached the outskirts of the village of Far'ata, according to the indictment. They donned masks and gloves and came bearing spray paint and flammable materials. The indictment then claims that the three ignited a Volvo and a Mercedes, tagged the scene with Star of David graffiti, and then high-tailed back to Gilad Farm. The document requests that the three be given the maximum punishment for their crimes. "Price Tag" refer to incidents of nationalistically-motivated criminal damage against Arab-owned property by Jewish extremists, often in revenge for deadly Arab terrorist attacks.